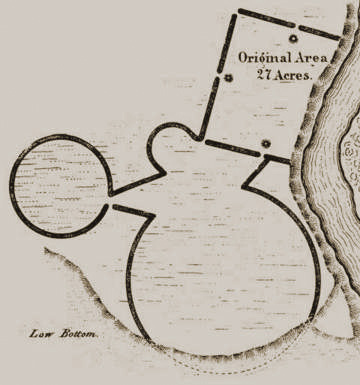 Liberty Township Earthwork and High Bank Octagon Earthwork. "This work is a fair type of a singular series occurring in the Scioto valley,-all of which have the same figures in combination, although occupying different positions with respect to each other, viz a square and two circles. These figures are not only accurate squares and perfect circles, but are in most cases of corresponding dimensions,- that is to say, the sides of each of the squares are each ten hundred and eighty feet in length; and the diameter of each of the large and small circles, a fraction over seventeen hundred and eight hundred feet respectively... It will be observed, that while the wall of the larger circle is interrupted by numerous narrow gateways, that of the smaller one is entire throughout,-a feature for which it is, of course, impossible to assign a reason, ... 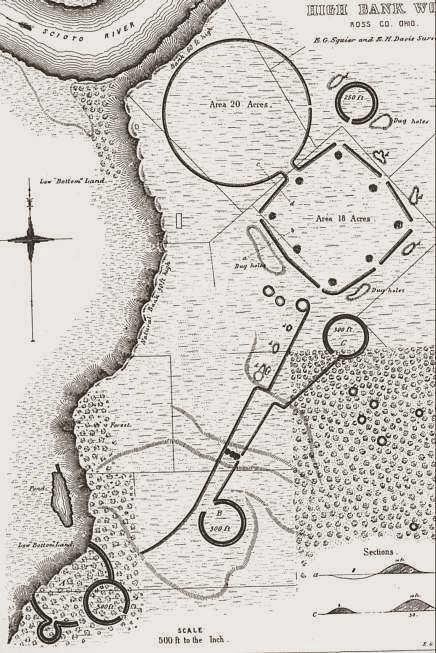 The whole work appears to have been partly finished, or constructed in great haste ... No one would be apt to ascribe a defensive origin to this work, yet it is diffcult to conceive for what other purpose a structure of such dimensions, embracing nearly one hundred acres, could have been designed," - Squier and Davis, 56. "It is not to be supposed that these numerous coincidences are the result of accident." - Squier and Davis, 71. Ancient Monuments Placemarks - Liberty Works and High Bank kmz files with map overlays.
" It can not be too often or too strongly impressed on the reader that these "coincidences," so often given and referred to in their text, have no existence in the works themselves, The larger circle of this group is plowed level, and no measurements could be obtained, The square is nearly obliterated, making any estimate of its angles or dimensions unsafe; but it appears to vary considerably from "accuracy." The smaller circle, however, is all in woodland or pasture, and could be surveyed without difficulty. Under the impression that this was the hypothetical figure given by Squire and Davis (see page 56) as absolute proof of the uniformity of curve, especial care was taken in its measurements. "The diameter, it is true, is given in their plate as 800 feet, while the supposed "perfect circle" had, according to their text, a circumference of 3,600 feet; or, as it was platted, circumscribed a dodecagon of 3,600 feet perimeter. 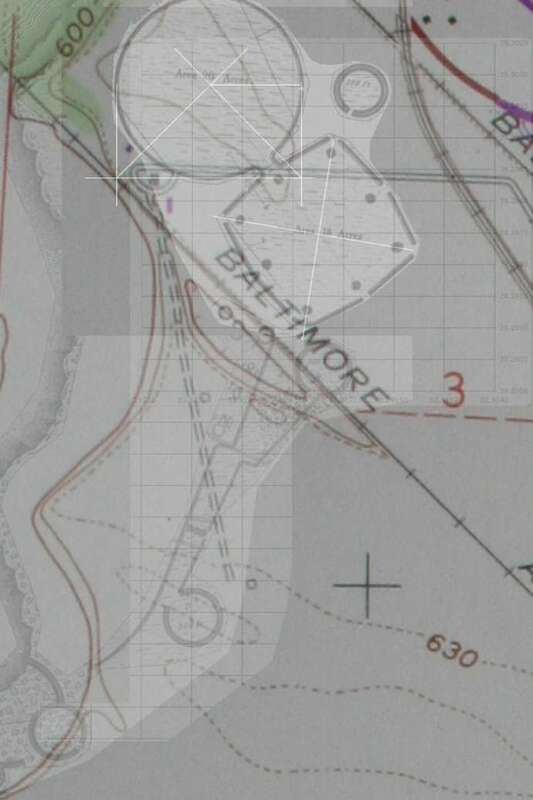 It was evident from this that an error existed somewhere, which we hoped to locate...."
Liberty Earthwork, with orientation corrected. "Stakes were set 100 feet apart along the middle line of the embankment, beginning at the south side of the gateway. The bearing of each stake was then taken from the one next preceding. Had the curve been regular, as claimed by the authors, each angle of divergence, to the last one, would have been the same. Instead of that, they read as follows: 21°35'; 3°09'; ..... twenty-two full chains, making 2200 feet. The last ... was thirty feet, making the angle of divergence much smaller than it would have been with a full chord, The wall terminated abruptly at station 1; as this portion is in land on which the original timber is standing, there can be no presumption that it ever extended farther, although in the original survey it is represented as reaching in an unbroken line to the gateway or opening and thence to the larger circle; as shown by the dotted lines in figure 26. From station 1 to station 24 the distance is 343 feet, making the entire circuit, by this system of short chords, 2,543 feet. Measured exactly on the circle, with allowance for curvature, this figure would have been slightly larger, It is only thirty feet in excess of the circumference of a true circle with a diameter of 800 feet; which goes to show that Squier and Davis merely ran a line around the embankment, called the work a "perfect circle," and made the diameter 800 feet for even figures. " Image right. Location of Harnass Mound and Liberty Earthwork is not readily discernable in the agricutural fields and yards covering the area today. Railroad tracks were laid through the square and circle, near parallel to the road. Right. 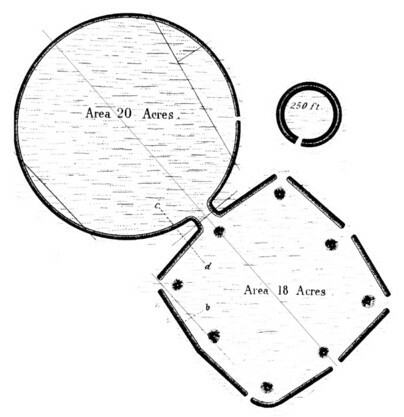 High Bank Octagon and Circle, part of the drawning by Squier and Davis. "The circular enclosure is almost geometrical in its accuracy; a radius of 526 feet will describe a circle which will nowhere miss the middle line of the embankment more than six feet. " Regarding the Octagon Thomas writes, "...this inclosure is comparatively regular, the oposite angles, with one exception, differing less than half a degree ... the regularity is not such as would be expected from the use of instruments." Topographic map, Squier and Davis drawing, and a chart of GPS readings are overlain to present the location of High Bank Earthworks. The Octagon image was positioned using a still-visible corner. 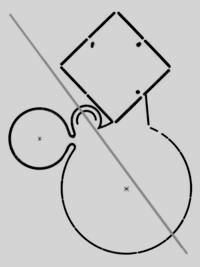 The adjoined octagon and circle were rotated to match the azimuth survey data by Thomas. 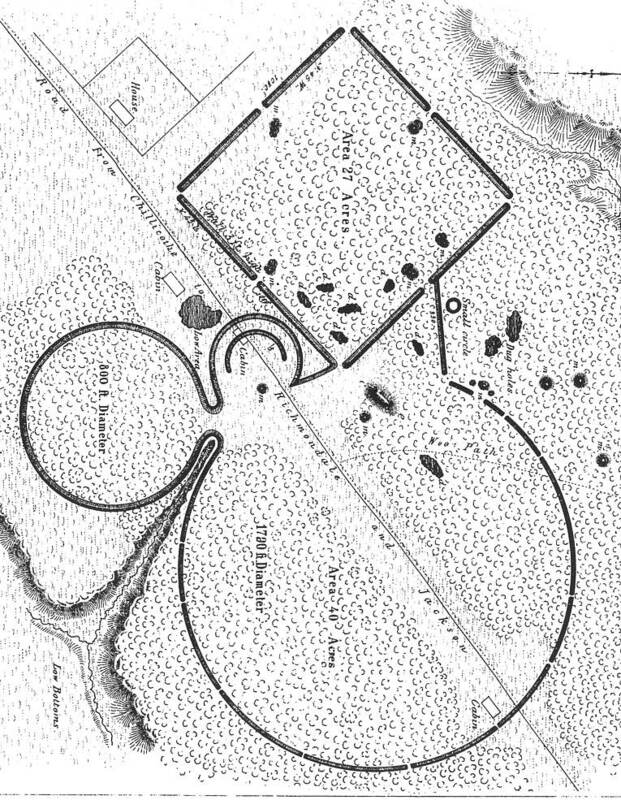 The extended work of linear embankments and circles, running south-southwestward from the octagon corner, were further rotated to fit the terrace better, so their locations are approximate. This is the entire work as depicted by Squier and Davis, and while their work is invaluable, their depictions of scale, relationships, and orientations are not all entirely precise representations, as Thomas noted in the quotes above. I used three GPS readings to locate the coordinate grid on the topography, including an octagon corner, a road with octagon intersection, and the road with railroad track intersection. Centerpoint coordinates (below) locating the octagon and circle were scaled from the grid. Thomas writes: " The irregularity at the southern corner is due to a depression which would interfere with easy approach, The opposite sides and angles are tolerably regular. 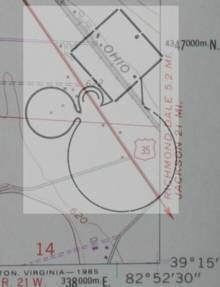 One diameter is 1,008 feet, the other 1,005 feet; the included area is 20.6 acres, It is possible Squier and Davis measured entirely within the walls; but in the adjoining circle their figures plainly refer to the top of the embankment. "The circular enclosure is almost geometrical in its accuracy; a radius of 526 feet will describe a circle which will nowhere miss the middle line of the embankment more than six feet." The Year 2004 Field Season at the High Bank Earthwork. on the opposite side of the Scioto River upstream and north of High Banks and Liberty Earthworks. Approximate coordinates of feature center points. Greber, N. 1983 Recent Excavations at the Edwin Harness Mound, Liberty Works, Ross County, Ohio. Midcontinental Journal of Archaeology Special Paper 5, Kent State University, Ohio. Hively, Ray, and Robert Horn 1984 Hopewellian Geometry and Astronomy at High Bank. Archaeoastronomy 7:S85-S100. Mills, William C. 1914 Archaeological Atlas of Ohio. The Ohio State Achaeological and Historical Society. Mills, W. C. 1907 The Explorations of the Edwin Harness Mound. Ohio Archaeological and Historical Society Publications 16:113-193. Thomas, Cyrus 1894 Report on the Mound Explorations of the Bureau of Ethnology. Twelft Annual Report of the Bureau of Ethnology. Washington.